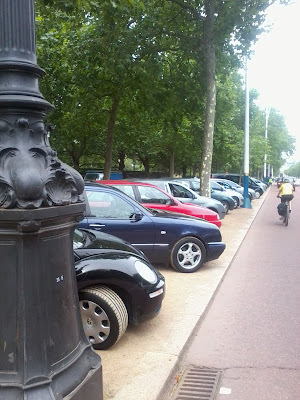 How many VWs can you park on a Superhighway? 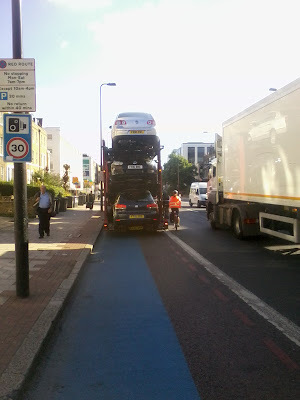 Paragon (hardly of virtue) had not one but two transporters full of VWs parked on Cycling Superhighway 7 at 08.30am on Wed 28 July. Check out the cyclist forced out nearby the passing HGV. Can you please tell me whether disciplinary action will be taken against the driver of your Tesco delivery vehicle AY55 JWA which was stopped in the Mandatory Cycle Lane of Cycle Superhighway 7 at 09.09am on Wed 28 July? 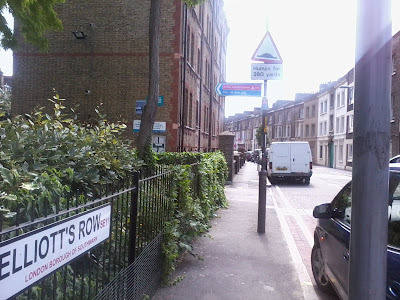 A photo can be found at www.kenningtonpob.blogspot.com . Should you not take disciplinary action please let me know the reason why this decision was made. At a set of red lights yesterday morning on CS7 going southbound I was obliged to move out of the blue lane into the mouth of the side ride to allow a convoy of four shiny black cars with flashing lights to zoom down the cycling superhighway, undertaking the motor traffic jammed in the offside lane. Bet that's royalty or equivalent I said to myself. 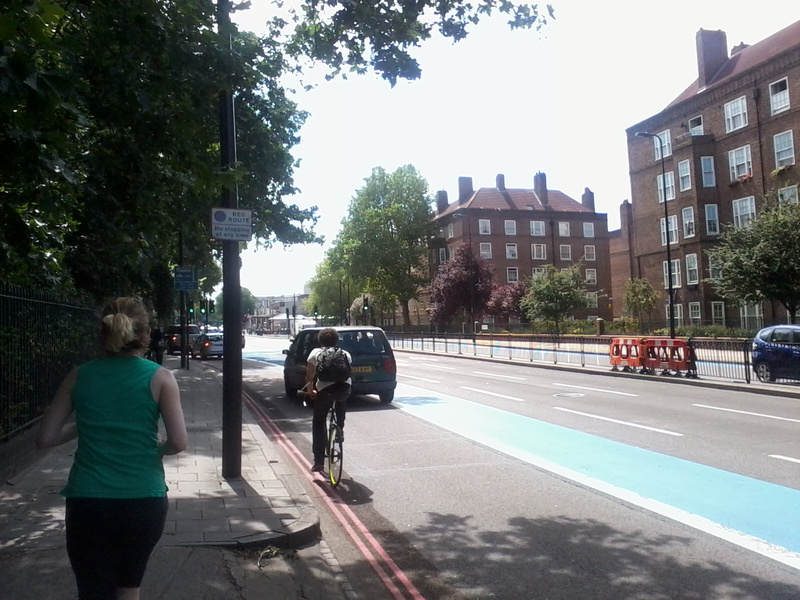 If it was them, I hope they enjoyed their ride on the cycling superhighway. Maybe they can cycle it next time. Licked on Westminster Bridge? Maybe not yet. I was entertained by the use of the word 'continue'. However, yesterday, just after I spotted the usual pair of vans trading on Westminster Bridge's red route, cycle lane and bus lane, a traffic warden arrived, issued a ticket and asked the driver to move on. Nope, they decided, too much money to be made breaking the law. 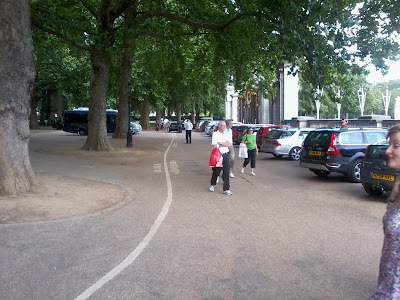 So the Traffic Warden called the police to this high security zone and a mere 15 minutes later a fit Constable arrives, having run all the way from Trafalgar Square. 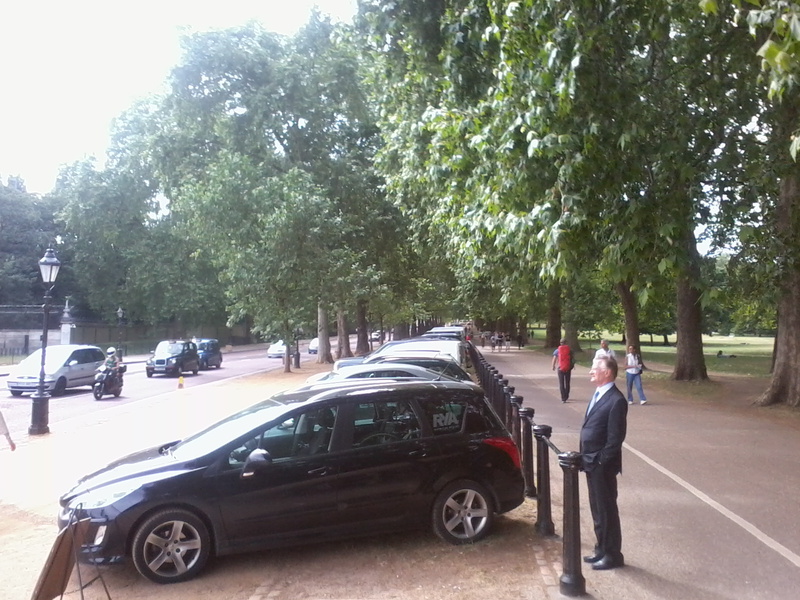 The drivers see him walking towards them and drive off. Then a police car arrives. I suspect the culprits won't get away with it for long. 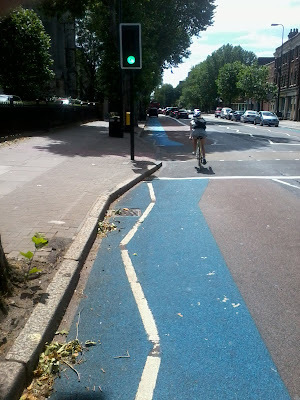 By chance today I had a ride on a bit of Cycle Superlieway 3 - going east from the City of London. The bit I was on is the reincarnated Cable Street segregated cycle lane. Here's a road it crosses - to a railway arch and car park for a local cafe. For some reason this is deemed significant enough to have priority over a superhighway! Further along though, traffic exiting the side road has to give way to the Superhighway. 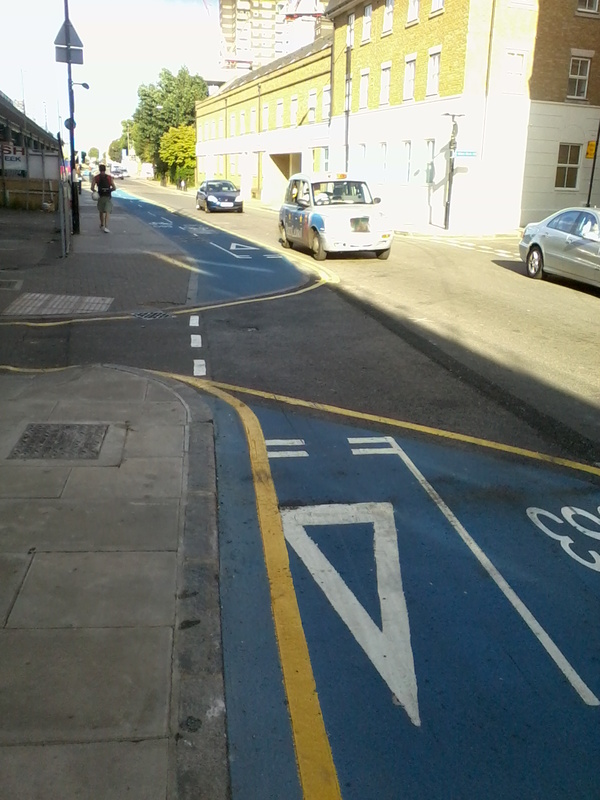 Traffic entering the side road seemingly doesn't need to though. Blimey it's a mess. Local resident Christie came in with a bike with a puncture. Pedal Power doesn't fix bikes, it teaches you how to do it so Leo explained what needed to happen and Christie got to work. 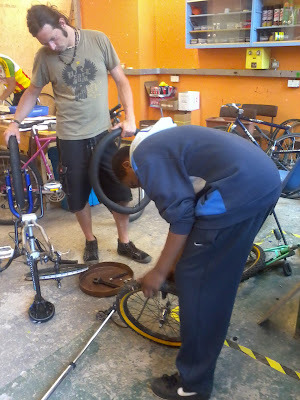 He must have been happy because he returned five minutes after he left with his friend Richard who learnt to fix the puncture he had! 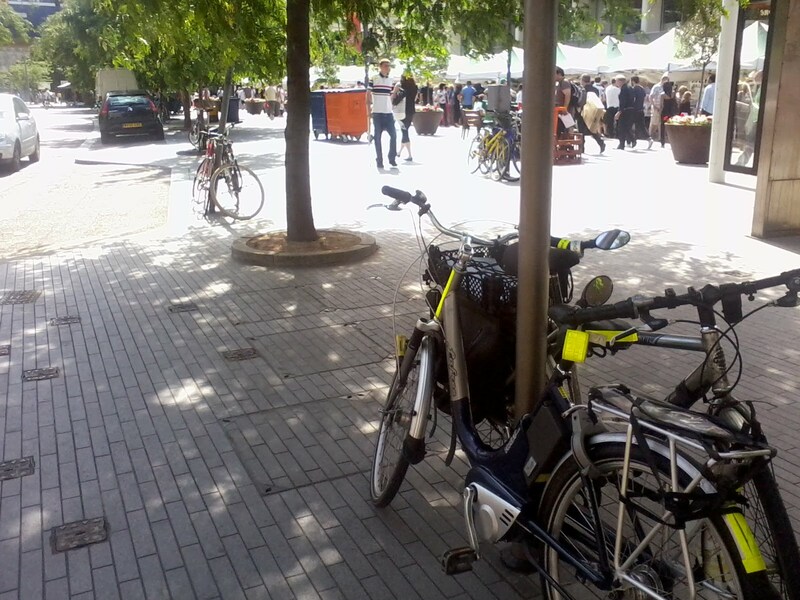 Two bikes back on the road, two happy lads. Result! According to www.royal.gov.uk, "With tea, cakes and a beautiful garden to stroll in, garden parties are among the most relaxed and informal Royal events. Most people like to dress up for their special day. Gentlemen wear morning dress or lounge suits, while women wear afternoon dress, usually with hats or fascinators. National dress and uniform are also often worn." 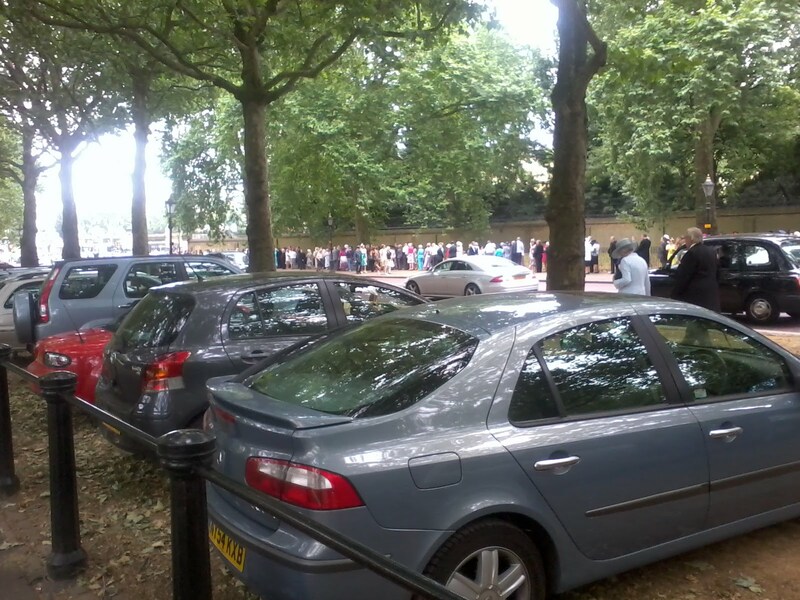 Around 8000 people are invited to each of the Garden Parties held at Buckingham Palace during the summer. 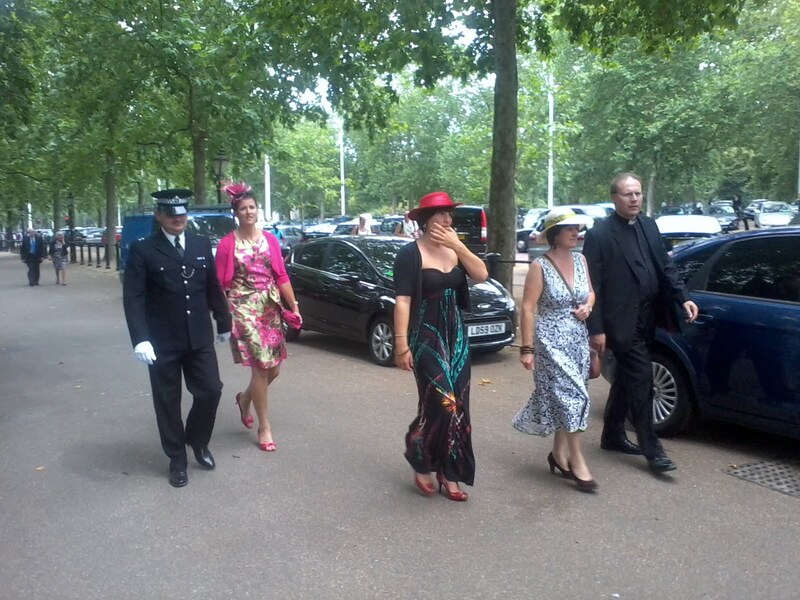 It would be splendid to see them on the tube, bus or bicycle in their finery. 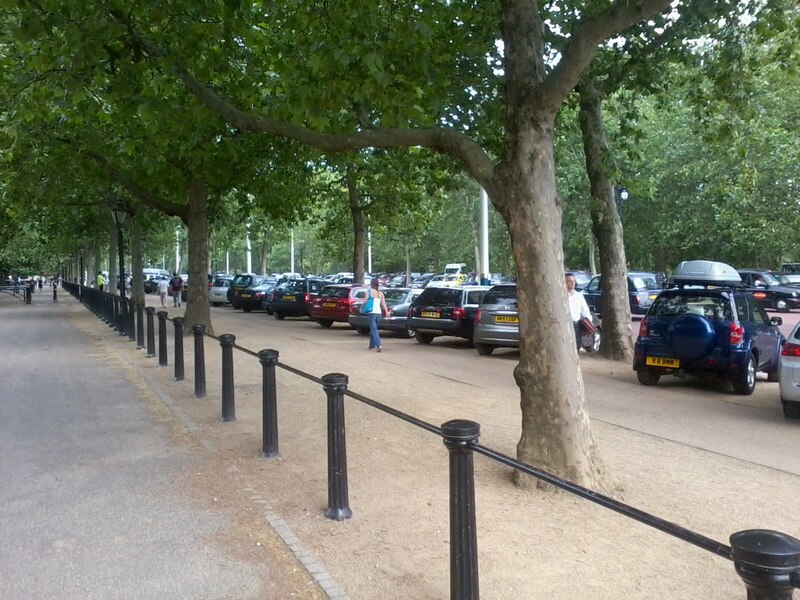 Unfortunately the protocol is to provide 2000 temporary parking spaces on the Mall and Constitution Hill, encouraging the private car over more sustainable forms of tranport. I'm sure the royal garden is beautiful, but outside is an eyesore for the day. 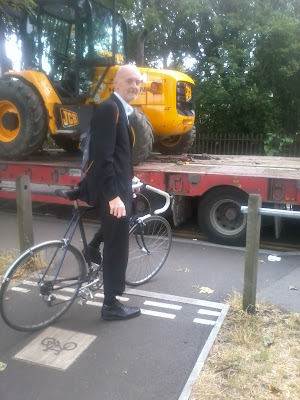 Councillor Hasleden was avoidably detained on his way to the launch of Cycling Superhighway 7 on Clapham Common having opted to take the mellow London Cycle Network 3 across the common rather than fiddlearse around with the blue stuff on the road. His journey was truncated when he was stopped in his tracks by a large lorry parked slapbang across LCN+3 on Windmill Drive just as he neared the Superhighway launch marquee full of people celebrating London's improvement in cycling conditions. 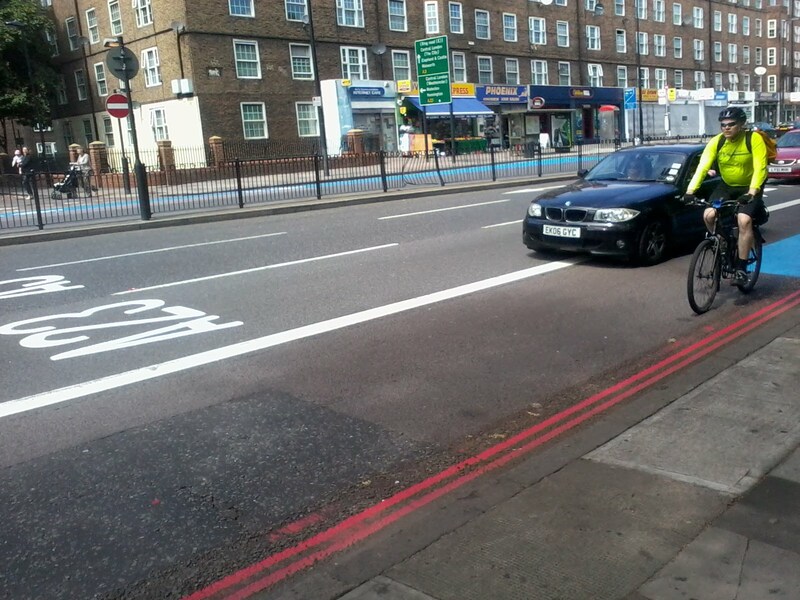 A couple of police on bikes passed by and had a word with the driver whose lorry was parked illegally on double yellow lines. 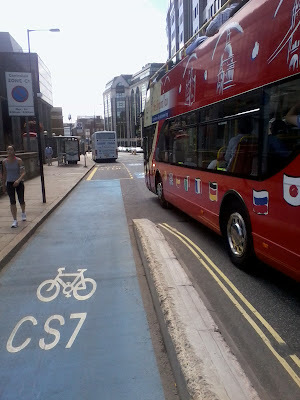 They didn't make him move though - clearly blocking LCN+3, still used by hundreds of cyclists a day despite the nearby blue goo, is not a concern to the Met. You remember that mandatory cycle lane that Vince Cable's car was parked in? Well it's gone. 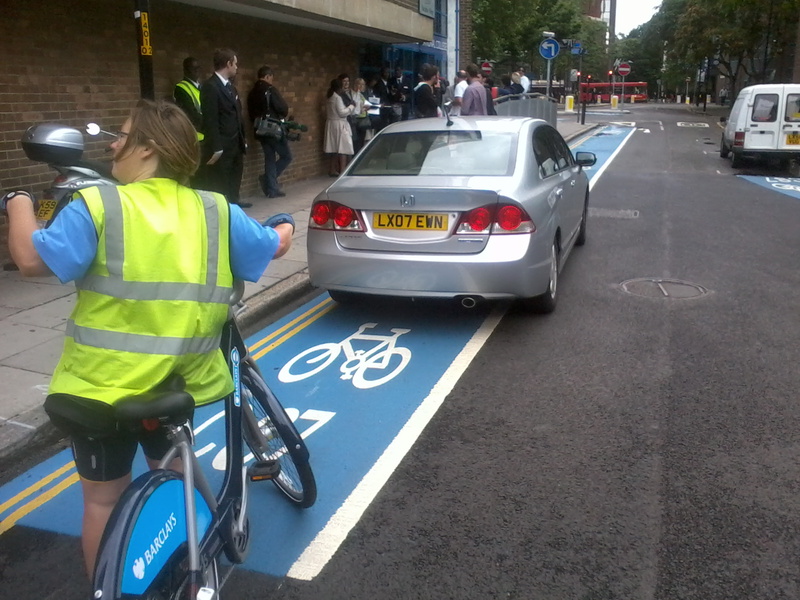 I'd have expected the parking on the other side to have gone but clearly I've got different priorities to TfL. These blue areas have no legal status (unless they have a white line painted along them) but might lead an inexperienced cyclist to believe they should follow them. 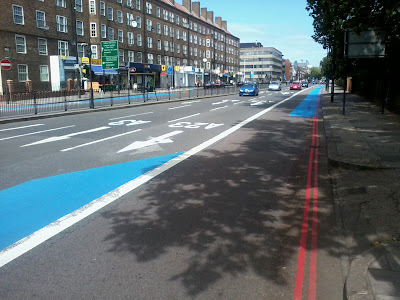 Given that, it would seem obvious to make the blue 'lane' wider rather than having a cyclist on it suddenly swerve with the blue paint into the rest of the bus lane to avoid the build out. After all it could make a bit of a mess if a motorcyclist is zooming down the bus lane (as they're allowed to do). Much of the concern about the implementation of the Cycling Superhighways has centred on resolving several key tricky junctions. Southbound by Kennington Park, where the road splits with the A23 going left and the A3 (CS7 route) going straight on, was horrible before. 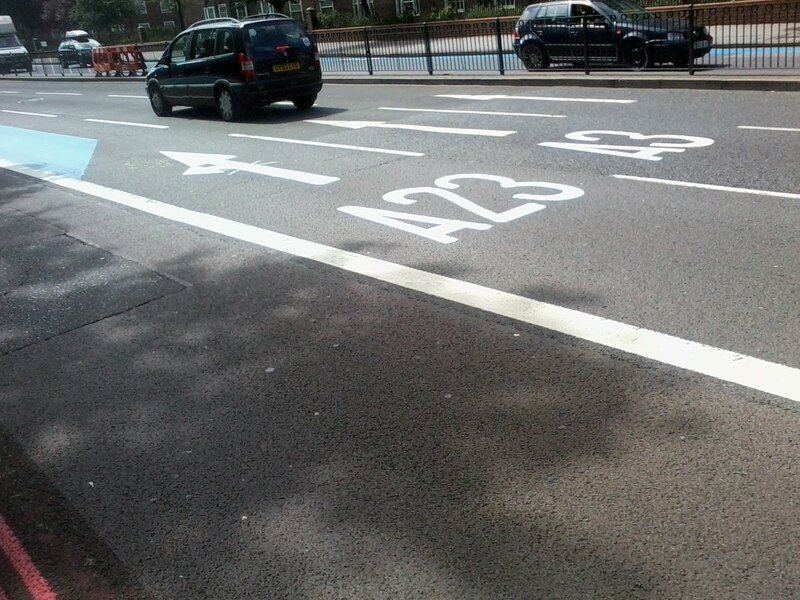 Presumably you're meant to go across the bus lane into the lane marked A23, albeit hardly the obvious choice of lane to be in if you're wanting to go down the A3. Bizarrely the A23 manages to go both straight on and left here. 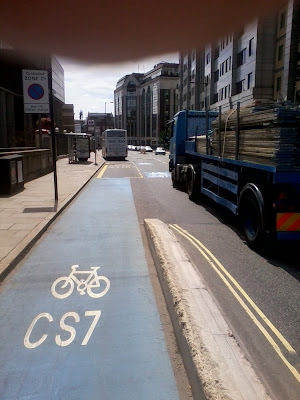 Remember the Cycle Superhighways are "safe", "comfortable", "clearly marked and easy to follow" - so just shut you're eyes and nip across, you'll be fine. 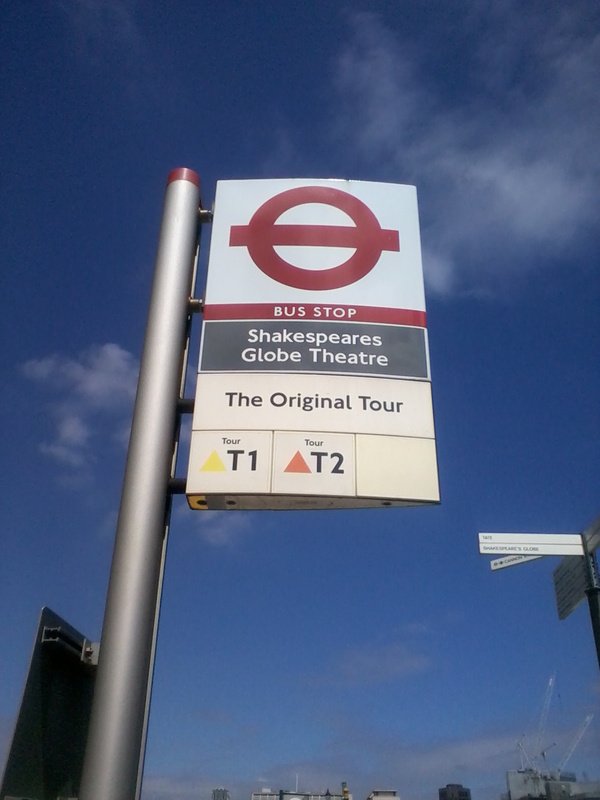 Direct and continuous - The routes will be clearly marked and easy to follow. 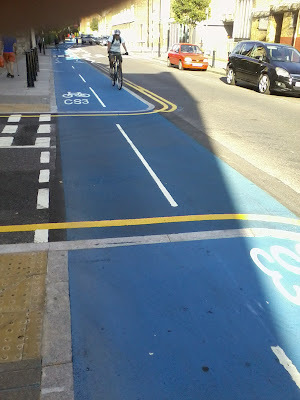 There will be new signage and road markings, and information about journey time and links to other cycling routes"
I'm sorry but turning left there certainly won't get you to the City in 10 minutes. 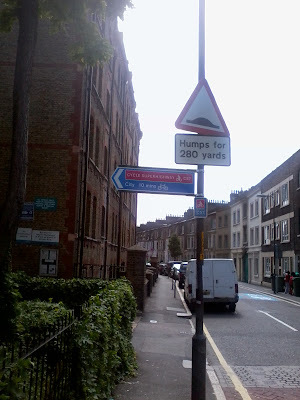 Ah well, as least it's clearly marked and easy to follow - after all, they never said that the signage would point you in the right direction. I think the idea of 12 fast cycle routes into/out of Central London is excellent, but a good concept needs equally good implementation. How's it looking on the eve of the launch? Let's get the obvious out of the way. 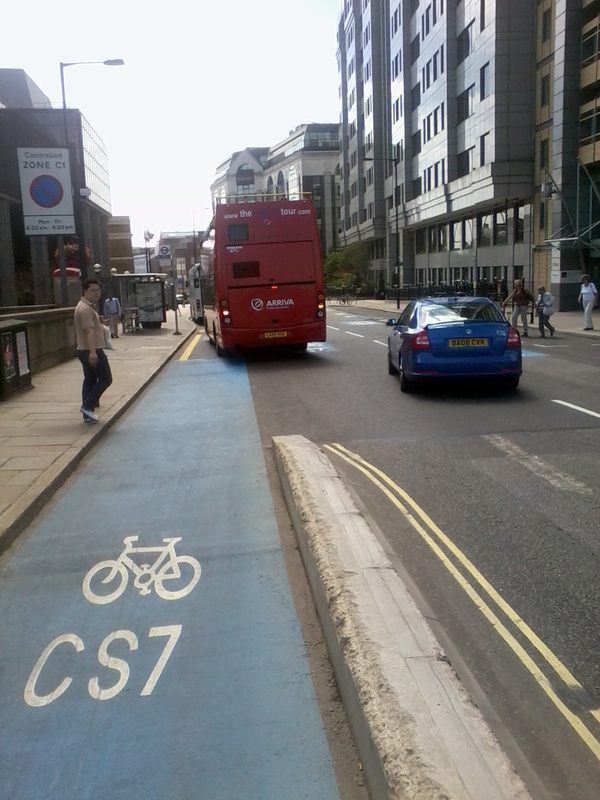 Cycle Superhighway 7 is only intended to be such for 15 weeks a week each way (M - F 7 - 10am inbound; 4 - 7pm outbound). The rest of the time it's fine to park motor vehicles in much of it, making those part of it as effective as a chocolate teapot for the equivalent of 6 5/8 out of 7 days. So, what about those 15 hours per week? 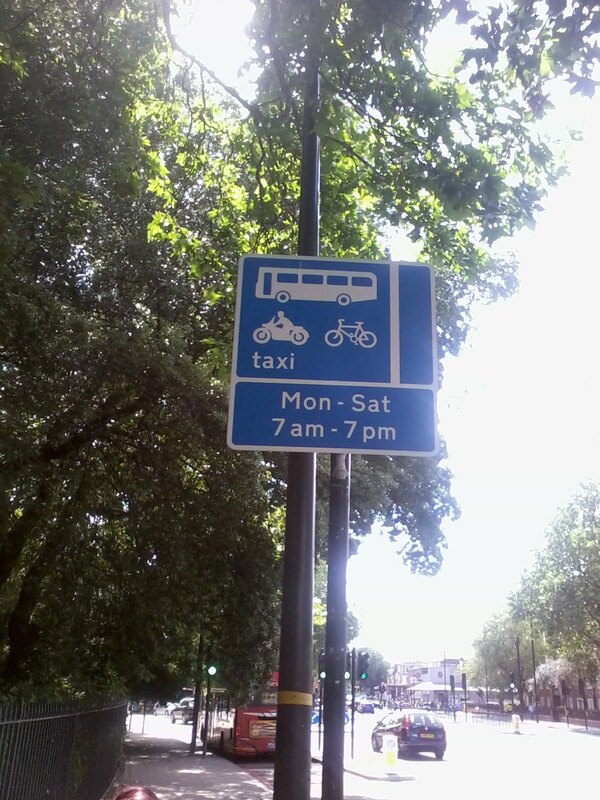 Cyclists are expected, due to a bus stop and coach parking, to change lane and merge with motor vehicles zooming south over Southwark Bridge. 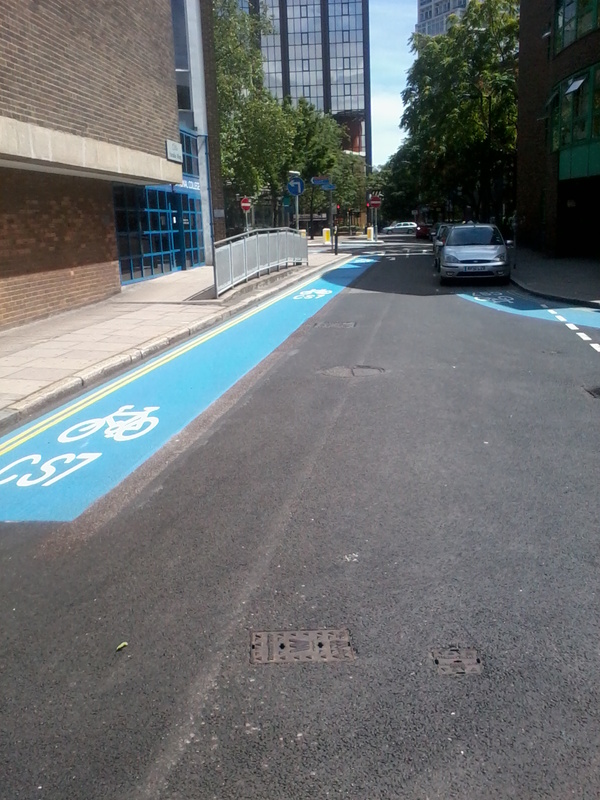 "Comfortable - We'll be improving road surfaces and minimising obstructions along the routes so you can pedal more comfortably." "Safe - The Cycle Superhighways will be at least 1.5m wide and provide continuous cycle lanes at junctions, advanced stop boxes, and signals to help you keep safe." Now, I wonder who has priority - the bus coming into stop or the cyclist in what was their lane? And what are these buses that are so crucial they must have a stop right there? It seems clear that the Cycling Superhighways aren't about prioritising cycling. There are three rides coming up for Kennington families, all leaving from the Lilian Baylis Community Hub in Lollard Street SE11 6PY. The first is this Sunday to Lambeth Country Show in Brockwell Park, leaving at noon and returning at 5pm. 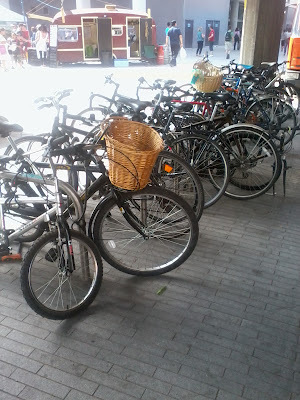 On Sunday 1st August there's a picnic ride to Hyde Park (a good chance to try out a new Hire Bike from the Lollard Street hire point), and on Wednesday 25th August a picnic ride to Horniman Museums and Gardens. 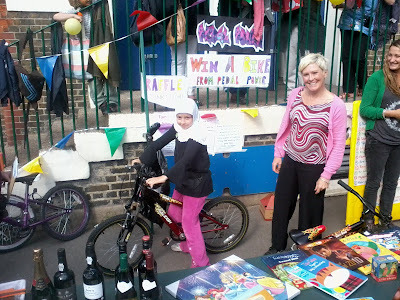 A wonderful, if windy, afternoon on Friday at the primary school's Funday. Pedal Power Kennington had six bikes to give to children without bikes. 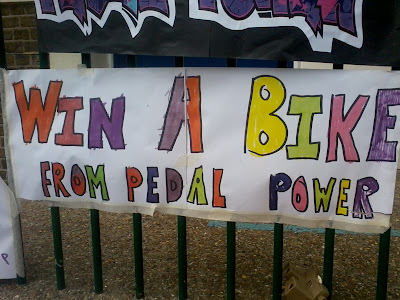 The kids came to the stall and were checked for size against a bike and then were entered into a free raffle for that bike. 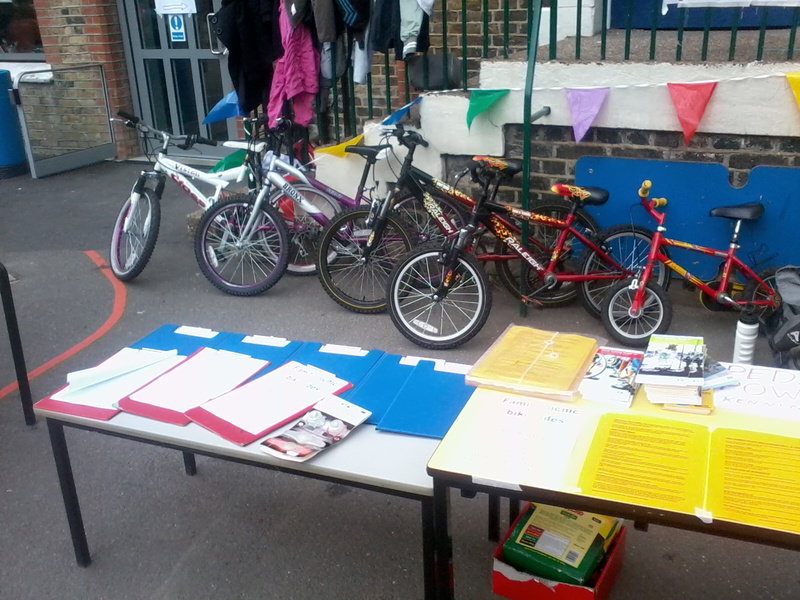 At the end of the day the Head drew the winners and six children went home with free bikes. 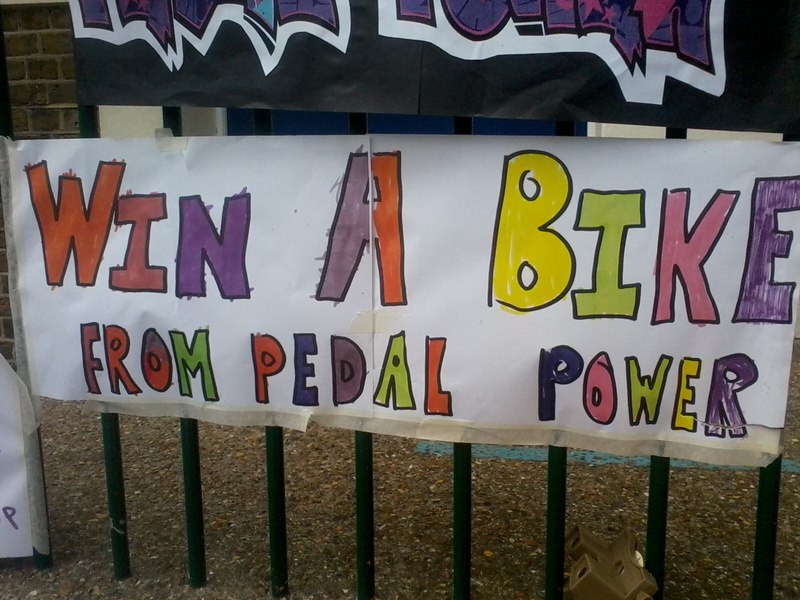 The deal is that as they grow out of them they give them back to the school ready to be redistributed by Pedal Power. 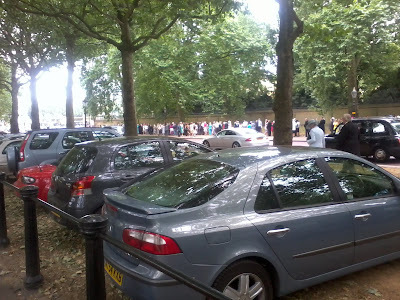 Today at 11.15 there were a handful of photographers and placard wavers outside South Bank University getting bored waiting for the Rt Hon Dr Vince Cable MP. Secretary of State for Business, Innovation and Skills and President of the Board of Trade, to come out from whatever he was doing in there. 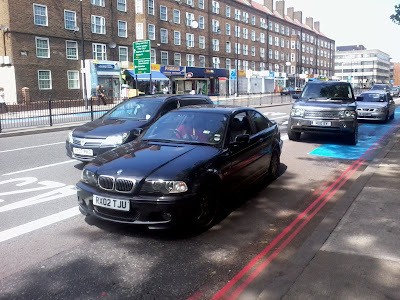 His driver (according to onlookers) was parked, engine off, waiting for him also - just as I was giving a cycling lesson on one of the new Mayor's/Barclay's Hire Bikes to a prospective user of the Mayor's new Cycling Superhighway 7. You MUST NOT wait or park on yellow lines during the times of operation shown on nearby time plates (or zone entry signs if in a Controlled Parking Zone) – see 'Information signs' and 'Road markings'. 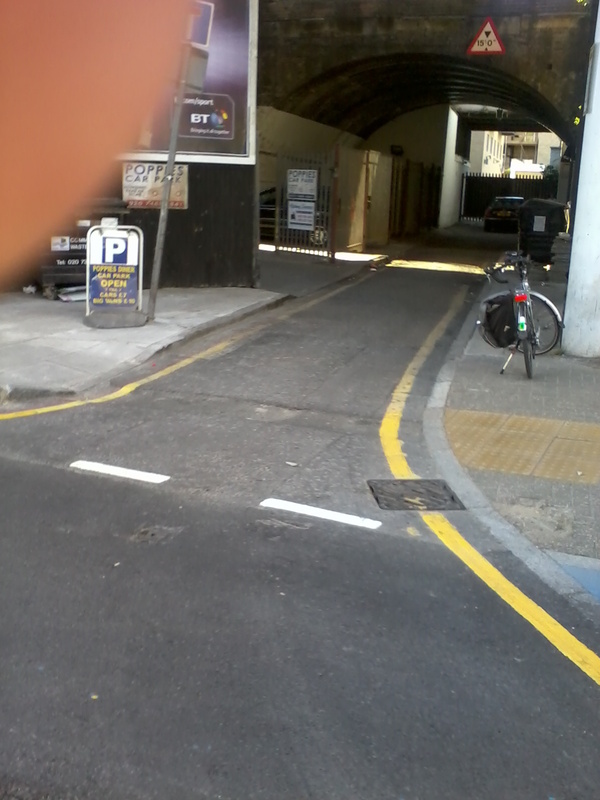 Double yellow lines indicate a prohibition of waiting at any time even if there are no upright signs. 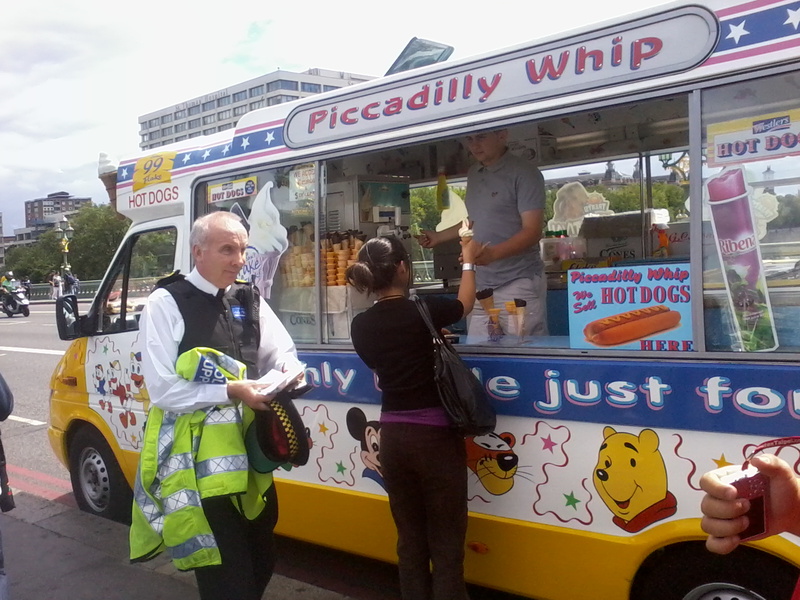 I trust the driver will be disciplined by his employer. So I spent my money on lunch elsewhere. 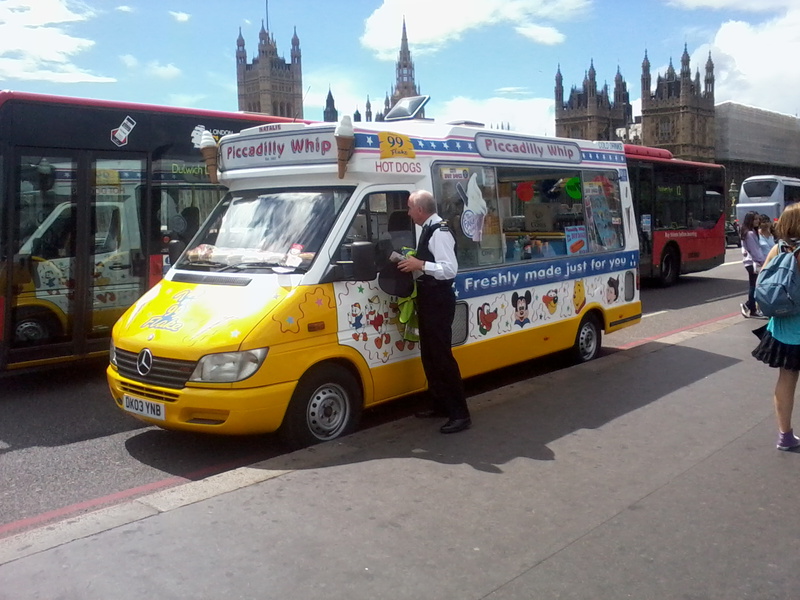 It is ludicrous that two ice cream vans (one pictured) can regularly and blatantly sell ice-cream on Westminster Bridge in the bus and cycle lane on the red route in, I believe, the Bishops Ward, Lambeth part of the bridge. 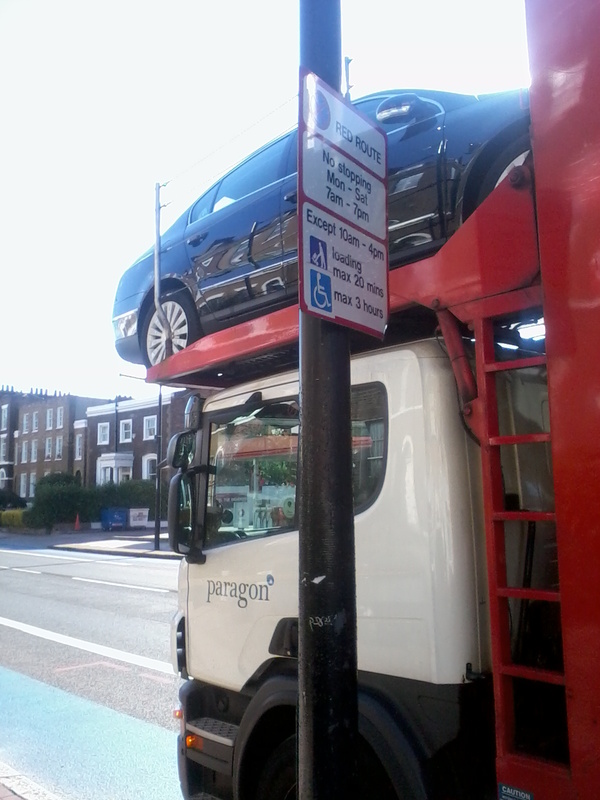 Please TfL re parking or, if Lambeth has the jurisdiction on illegal trading, act on this. 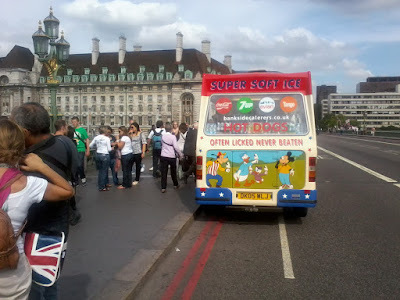 There must be security cameras, Palace of Westminster Marksmen in need of practice, and even some traffic wardens who could do something every time the vans stop on the bridge never mind set up shop. Surely the South Bank Employers Group have security staff who could radio in when they appear. 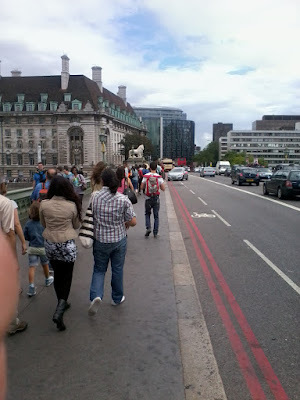 I would hope that I never see them there again from a week's time. Otherwise I'll have to suspect someone's being paid a large sum of money to turn a blind eye.